A message of assurance or re-assurance to two kinds of people here this morning. You are losing confidence in God. You are not too sure about your place or stand with God. You are not sure if God is really there for you. To another person, you know that God cares for you; but you don’t know how much or how well. The message is also to the church collectively as an entity. What God says I should tell you this morning is that you are precious in His sight. The truth of the matter is God will always be God; He remains the same. The problem is that we His children sometimes entertain doubt and unbelief. So, this message is to serve as an affirmation from God to certain individuals and the church. Something that is of great value, not to be wasted or treated carelessly. Greatly loved; dear; cherished or treasured by someone. 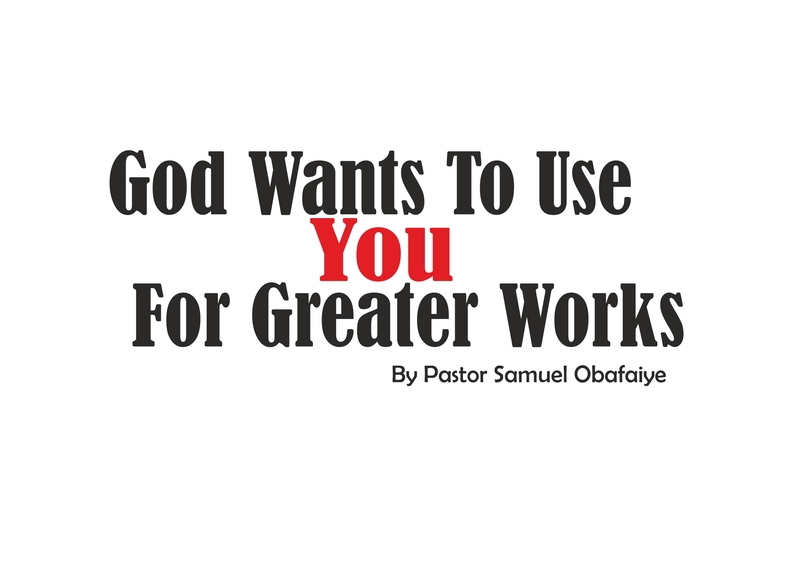 God is saying that you are of great value to Him; you are not to be wasted or treated carelessly. You are greatly loved. You are dear to Him. You are cherished and treasured by God. He also holds you in high esteem. Prophet Isaiah reigned in the time of Kings Uzziah, Jotham, Ahaz, Hezekiah and Manasseh. These are kings who didn’t honour God, except for Hezekiah. Isaiah gave them warnings from God, but they won’t listen. Eventually, the people were taken into captivity in Babylon. At the time of writing this Chapter, they were about 50 years in exile. They had thought that God had forsaken them; they possibly were worshipping the Babylonian gods by now, as they would think that those gods were stronger than theirs for them to be conquered. God, however, sent Isaiah again to them in captivity to assure them of their position in His heart. That they were very precious in His sight. He will be with them in whatever they were to go through; and that He was prepared to make daring exchanges on their behalf. Also, He would gather them and bring them back to their land. There is an adage in Yorubaland, that says, “whoever says he will buy one a dress; one will need to judge the person by what he wears first”. It is very unlikely that what he will buy for you to be higher than what he wears. So, it is necessary to look at this Person/Being who says we are precious in His sight. What does that mean? Of what benefit is that to us? How weighty or of what importance is the sentence He made? – The Lord – the One who has all authority, power and control over others. – The Creator of Jacob – brought them forth. – The Sculptor of Israel – reshape his life and destiny. – Your name Giver/Caller (Rom. 9:9-13; Gen. 32:26-30). Why did God make these strong statements? Judah was going through a tough time. They have been in captivity for 50years. To let them know that He has not forgotten them. To re-confirm the covenant that He made with Abraham. To introduce Himself to a generation that had not encountered Him or see their homeland. To encourage their faith to rise (Heb. 11:6). He has pity for His people. What did God say to them? What did He ask me to say to you? – Whatever happens to you before has gone, but now the story is about to change. It’s a new dawn, it’s a new beginning. – They must not be afraid. We all do entertain fear. Fear is not of God. Fear of yesterday and tomorrow. Rather than just focusing on today. Jesus said the hardship of each day is enough. – They belong to Him. They are His responsibility. You are God’s responsibility. – He will protect them from all kinds of dangers: water (trials that send shivers through your spine, develop cold feet), rivers, fire (trials that are too hot to handle, fiery furnace), flame. None of these things will overwhelm them or consume them. – God may not build a bridge, a boat, a submarine or plane to fly across; but His promise is that He will be with you as you pass through. – He has given Egypt, Ethiopia and Seba as the ransom for them. 3:1 ratio. – They have been precious and honourable to Him. – And He loved them. – He will give men to them; people in exchange for their life. – He is with them, so they should not fear. – He will gather their sons and daughters to Himself from the four corners of the Earth. – Also, everyone that has a relationship with Him; will enjoy these blessings for He has created such people for His glory, He has formed such and made them. There is a bible passage that always makes me marvel. It’s Jeremiah 15:1. Jeremiah 15:1 – Then the Lord said to me, “Though Moses and Samuel stood before me, yet my heart would not turn toward this people. Send them out of my sight and let them go! What was the reason for that statement from God? Under Manasseh king of Judah (the son of Hezekiah), the land of Judah was greatly polluted with idolatry. Manasseh made the Israelites to sin more than even the nations around them. 2 Chronicles 33:1-9 – Manasseh was twelve years old when he began to reign, and he reigned fifty- five years in Jerusalem. And he did what was evil in the sight of the Lord, according to the abominations of the nations whom the Lord drove out before the people of Israel. For he rebuilt the high places that his father Hezekiah had broken down, and he erected altars to the Baals, and made Asheroth, and worshiped all the host of heaven and served them. And he built altars in the house of the Lord, of which the Lord had said, “In Jerusalem shall my name be forever.” And he built altars for all the host of heaven in the two courts of the house of the Lord. And he burned his sons as an offering in the Valley of the Son of Hinnom, and used fortune- telling and omens and sorcery, and dealt with mediums and with necromancers. He did much evil in the sight of the Lord, provoking him to anger. And the carved image of the idol that he had made he set in the house of God, of which God said to David and to Solomon his son, “In this house, and in Jerusalem, which I have chosen out of all the tribes of Israel, I will put my name forever, and I will no more remove the foot of Israel from the land that I appointed for your fathers, if only they will be careful to do all that I have commanded them, all the law, the statutes, and the rules given through Moses.” Manasseh led Judah and the inhabitants of Jerusalem astray, to do more evil than the nations whom the Lord destroyed before the people of Israel. So, God spoke to Jeremiah that the sin of Judah under Manasseh was so grievous that they just must be punished. There are times when one misbehaves as a child, and one would need to look for a friend’s parent or an elderly person that is precious in the sight of one’s parent to plead on one’s behalf. That has happened with the Israelites when priest and prophets would intercede for them. Here, God mentioned two of the most precious persons to Him that had ever lived – Moses and Samuel. What a gem they were and are still in God’s sight. Moses was the only one that saw God in person! He spoke to God as man to man. People will see the cloud God was speaking from and sometimes hear their conversations! Deuteronomy 34:10-12 – And there has not arisen a prophet since in Israel like Moses, whom the Lord knew face to face, none like him for all the signs and the wonders that the Lord sent him to do in the land of Egypt, to Pharaoh and to all his servants and to all his land, and for all the mighty power and all the great deeds of terror that Moses did in the sight of all Israel. Moses was able to intercede for the Israelites severally when God was moved to wipe them off. Ex 32:11-14 – at Mt. Sinai, why does your anger burn so much? Num. 14:13-23 – when the whole assembly rebelled after the 10 spies? He was so precious to God that he became like a god in his time. Exodus 7:1 – And the Lord said to Moses, “See, I have made you like God to Pharaoh, and your brother Aaron shall be your prophet. While people were sleeping; God will quietly come down to have discussions and fellowship with Samuel. He was able to intercede for the people when they rejected Theocracy and wanted Monarchy. God pardoned their sin. He was so precious to God, that he became as a god in his time. I Samuel 3:19-21 – And Samuel grew, and the Lord was with him and let none of his words fall to the ground. And all Israel from Dan to Beersheba knew that Samuel was established as a prophet of the Lord. And the Lord appeared again at Shiloh, for the Lord revealed himself to Samuel at Shiloh by the word of the Lord. 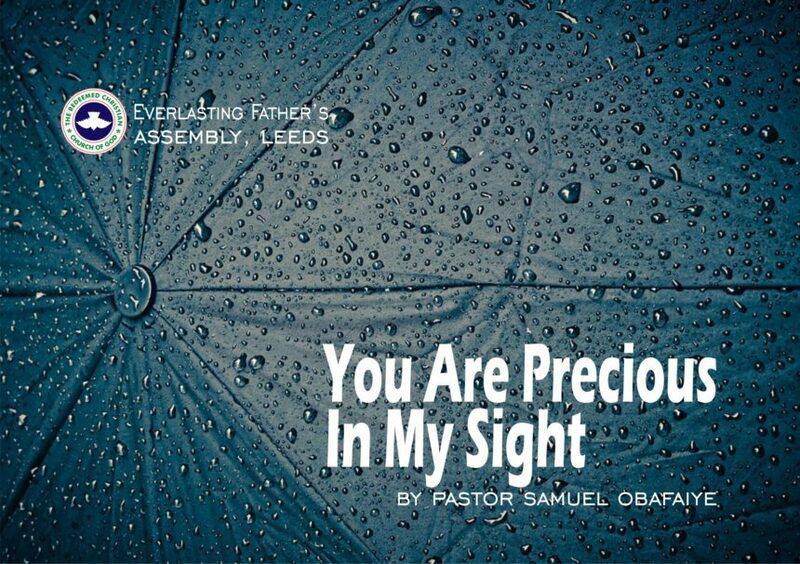 The same God has asked me to tell you that you are precious in His sight. I understand this a bit. Some 26 years ago, I heard God whispered this to me before. He stood by His word. Not because of my righteousness, but simply by His favour. Deuteronomy 7:7-8 –It was not because you were more in number than any other people that the Lord set his love on you and chose you, for you were the fewest of all peoples, but it is because the Lord loves you and is keeping the oath that he swore to your fathers, that the Lord has brought you out with a mighty hand and redeemed you from the house of slavery, from the hand of Pharaoh king of Egypt. If God says you are precious in His sight, what should be your response? What should be my response? – I must not entertain fear of any kind anymore (Mt. 28:18-20). – I must reverence and honour Him in return (Psalms 124:1-6). – I must do things that are pleasing to Him and obey Him (Deut 7:11). – I should be full of joy and be glad (Psalm 126:1-3). Father let Your love and affection for me truly sink into my being. Father demonstrate to the whole world that I’m very precious to You. Father let Your presence with me be very glaring to see and know.